In 1602, York herald Ralph Brooke challenged 23 coats of arms granted by William Dethick, including the arms originally granted to Shakespeare’s father, John Shakespeare, and now belonging to William Shakespeare. Brooke argued that these coats of arms were granted to unworthy or deceased individuals, or, in the case of Shakespeare, that they too closely resembled the ancient arms of another family. Dethick defended Shakespeare’s coat of arms by pointing out their unique features and John Shakespeare’s civic career and marriage into the Arden family. The outcome is not recorded, but the dispute appears to have been resolved in favor of Dethick. 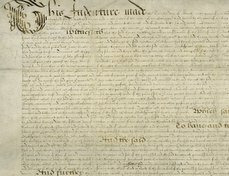 This manuscript, in Brooke's handwriting, is part of a group of documents relating to this dispute. Shakespeare’s coat of arms appears in the top row, among 24 other coats of arms included by Brooke in his attack against Dethick. There are two additional coats of arms at the end; otherwise, the names and order are exactly as the list of 23 coats of arms made by Brooke in an earlier attempt by him to accumulate evidence against Dethick. A note by Brooke on the other side indicates that he presented a copy of the document to Queen Elizabeth. The manuscript typifies Brooke’s frustrated ambition and his energetic attacks against Dethick. 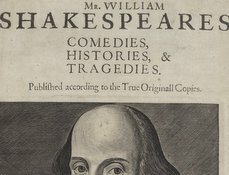 The manuscript is first noticed in Stephen Tucker, The Assignment of Arms to Shakespeare and Arden, 1596-99 (1884), p. 13, and then in J. W. Walter, Shakespeare's True Life (1890), p. 51. 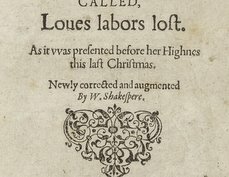 B. Roland Lewis describes it in The Shakespeare Documents, vol. 2 (1941), pp. 345-6.
see the booke of Differ. 61/. See knyghtes of E.1 fol. 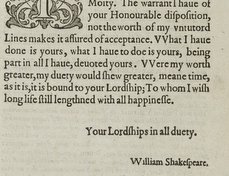 Ralph Brooke's compilation of arms granted by William Dethick: copy with the arms of "Shakespeare the player"
Ralph Brooke's compilation of arms granted by William Dethick: includes the arms of "Shakespeare the player"